Please follow this guide carefully to ensure your Teamgo iPad application and web Dashboard are updated correctly. If you are required to update the Teamgo application on your iPad, it's best practice to follow the guide below. This update process will generally take up to 10 minutes to complete if done correctly by a first time user of Teamgo. Please note the steps in this guide must be followed carefully. Preparing your iPad is important so you get the best performance from Teamgo. Logout by pressing the Home button on the iPad and then double tap the home button and "Swipe Up" to close the app. 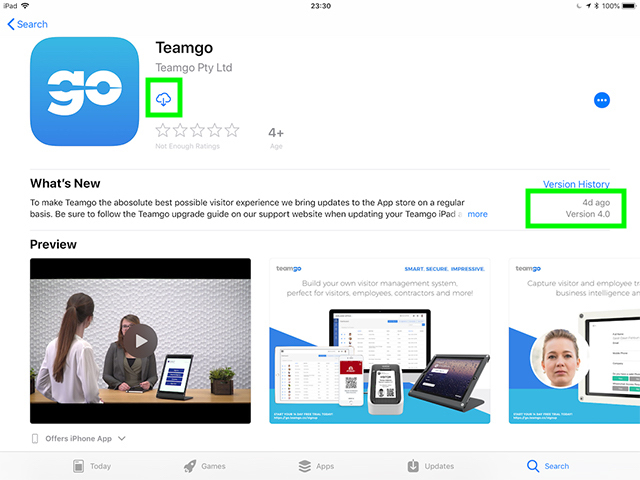 Locate the Teamgo app on your iPad and press and hold the icon for several seconds until it begins to jiggle. You can now press the small cross (X) on the corner of the app icon to delete it from the iPad. IMPORTANT: You must delete the app from the iPad screen not just the quick access dock. Ensure there is no Teamgo app icon on the iPad anywhere. IMPORTANT: Your iPad will need to restart once iOS has been updated. Allow your iPad to restart, make sure it is connected to WiFi and fully charged. Default iPad settings may cause issues with the performance of Teamgo, specifically the on screen keyboard. Delete all other apps the iPad will allow you to, do not run other apps in the background. For a detailed guide on how to setup your iPad please view our other article on preparing your iPad for Teamgo. Important: Once you have removed the Teamgo app, updated the iPad and prepared it for using Teamgo restart the iPad again. The Apple App store should always have the latest version of Teamgo available. Check to ensure you are viewing the latest version of Teamgo on the Apple app store before installation. Locate the Teamgo Visitor Management System app and tap the icon to view the app details screen. If you are certain you are viewing the correct version press the GET button or the download icon to install Teamgo on your iPad. The first time you launch the new Teamgo app you will be presented with the login screen but do not login yet. We need to verify the correct app is installed. Check the correct version is displayed in the bottom of the screen (at time of writing this is Version 4.0.1.8). Enter your admin email username and password then press LOGIN to continue. You will now be logged into the correct version of Teamgo. You will need to reconnect your printer to Teamgo again if you are using badge printing. This does not Please use one of the guides below depending on the printer model you use. Ensure your printer is setup correctly first. If all steps above are completed, you can now load your desired terminal. If you cannot see the terminal you wish to load use the Refresh function on the top right corner of the screen (blue refresh icon). The first time your terminal loads it will pull all the settings from the web dashboard which may take a few moments. Important: Please complete a full test of all functions to ensure its operating correctly as you would expect. Please note the steps in this guide must be followed carefully or you may experience the following issues when attempting to use the system. If issue arise from the update it's likely one of the steps above was not performed correctly. The most common problem is not deleting the Teamgo app and restarting the iPad before installing the new update. Deleting the app first will clear any settings or caching from the iPad app and memory and prepare it for a fresh install. Teamgo does not operate like other iPad apps, it uses systems resources for performance and security. If you print badges you will need to setup your printer again, you should not need to reconfigure the printer itself. We recommend setting up a brand new terminal to replace your old one. This will give you the opportunity to discover the new Terminal Designer and powerful visitor flow options. The new designer also has some great new templates and design options, it's a revolution in visitor management for your organisation. If you load the app and its stuck on any screen, its likely you did not delete the existing app first or you have an old version of the iPad or iOS. You may need to upgrade your device. Also check the iPad settings and ensure Location Services is set to Enables/Always. If you cannot locate your terminal in the list tap the blue REFRESH icon at the top of the screen. No problem, contact us at support@teamgo.co so we can assist you over live chat, email or phone. Be sure to leave your contact information, company and the issue your experiencing. We also have many other help articles, search the article database for more guides on setting up and managing Teamgo!